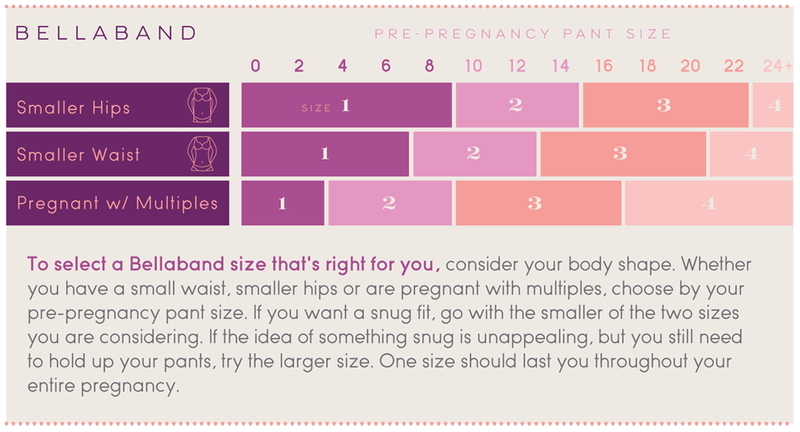 The BellaBand works throughout your entire pregnancy when pants, skirts or shorts aren’t fitting quite right. Early in pregnancy, slip this ultra-soft, seamless knit band around the waistline, over unbuttoned jeans, skirts and shorts to hold them up and hide the unfastened closures. It’s also ideal mid-pregnancy over too-loose maternity or snug-fitting transition wear, in late pregnancy as an extra-hold accessory for under-the-belly styles that fall down around the hips when the belly pushes them down, and after pregnancy when maternity becomes big and pre-pregnancy is bit snug. I like the quality of material and fit of this item, but I really dislike the silicone band. Just doesn't seem to sit properly on my body. I really like this band as an option over my undone regular pants to hold them up, or even on top of my pregnancy pants that fall down easily at this point. I do find the material isn't as thick as I thought it would be and the undone button/zipper can be seen depending on what shirt I'm wearing, but I still consider this a great purchase. Indispensable! I used one with baby #1 and bought another one for pregnancy #2. I have used it with pants and skirts and have not needed maternity clothes until late in my second trimester! If i could give this a zero i would. I hate it. Not only does it not keep my jeans up, its uncomfortable. Im already feeling icky & pregnant i just want to be cute & pregnant. Ill never buy it again. Love these bands. Has been great with transitioning in my pregnancy. Very happy with the purchase! This product has been really helpful for me later on in pregnancy. I use it to provide some light support but also as an under layer for my shirts which are now riding up. It does seem a little loose to me to hold pants on that aren't done up, I would have needed to size down for that. Love the Bella band! Perfect for keep pants up when you can't button them, or for lengthening tshirts that don't quite cover your belly. Also awesome for keeping that post partum belly in. This is a great product! The sizing chart is very accurate and it's also well priced. Don't know what I would do without these, I have them in every colour. Saves you hundreds of dollars by not having to buy new pants, especially in the first two trimesters. Worth every penny and more!